Dark circles around your eyes. How unsightly they look and even your best dress and layers of make-up sometimes does not quite succeed in concealing them! Blame it on your genes or your lifestyle, but, you cannot deny the fact that these are a blot on your beauty. And they become more prominent as you age. Let’s just debunk some of the myths as well as unearth some of the facts about the causes of these ‘panda eyes’. Dark circles under eyes usually are temporary and not a medical concern. You may be surprised to learn that fatigue usually isn't the cause of dark circles. Instead, the most common cause is nasal congestion. When your nose is congested, veins that usually drain from your eyes into your nose become widened (dilated) and darker. 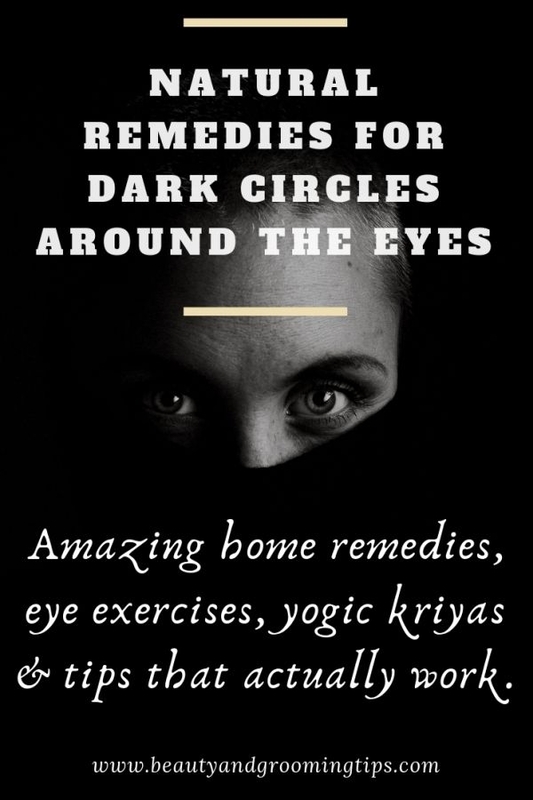 Let’s seek the aid of yoga, yogic kriyas and some of the time-tested home remedies to treat these dark circles. * A regular practice of Sarvangasana, a wonderful yogic posture gives good results. Then there is this ancient yogic practice of nasal irrigation Jal Neti that involves flushing the nose with salt water to help remove mucus. (View the videos for Sarvangasana and Jalaneti). Studies have shown that Jal Neti can help relieve symptoms of sinus, colds and allergies. These are some of the natural and highly effective ways of treating dark circles. However, you have to learn this procedure from an expert yoga instructor and not attempt it with half-baked knowledge. Now to our good-old home-remedies. * Put slices of oil-rich avocado under each eye. *Raw potato is yet another very useful aid. Put thin slices of raw potato over dark circles at least twice or thrice a day, every day. * Grate raw potatoes, add few drops of water, wrap it in a clean cloth and spread it over your eyelids. * Mix ground almonds and milk and apply under the eyes. 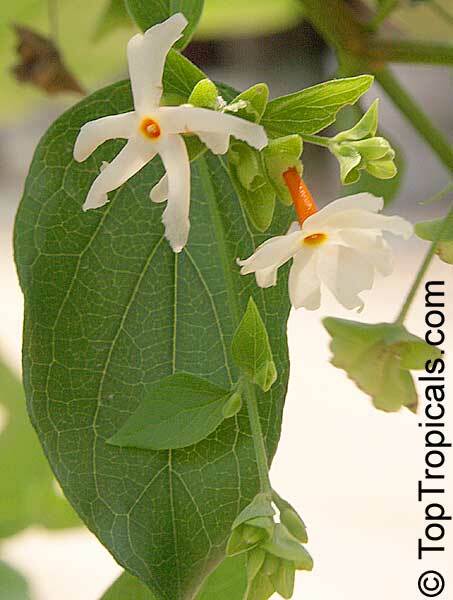 * Crush parijat flowers (night jasmine) (see pic), mix with curds and apply this pack under your eyes for 10 minutes. Then wash off with cold water. * You may also try applying orange juice and glycerine around the eyes. * Mix equal parts of tomato juice and lemon juice and apply. * You can also apply mint (pudina) juice around your undereye area for treating your dark circles. * Grated cucumber placed over your eyelids and around your eyes helps. You can also dab cotton pods in the cucumber juice and place it over your eyelids. This would work too. * Mix equal quantities of cornflour and yoghurt and apply. * Mix a tsp of castor oil with 1 tsp of milk cream (malai) and massage it around the eyes. * Make a paste of rose petals with milk and apply this paste around the eyes. * Use this home made under eye cream for your dark circles. Works like a charm. * Drink sufficient water. Also include buttermilk and yogurt in your diet. * Include plenty of fresh fruits and vegetable, especially colored ones like carrot, papaya, mango, green vegetables like spinach, curry leaves, sprouts in your diet. * Take 1-2 tsp of Gulkand (Rose petal preserve) regularly at night. As mentioned in the post on Gulkand, it's an extremely cooling health food that helps with many health issues. Besides helping with dark circles, it also relieves burning sensation in the eyes. You can also purchase it from the market. * Wash your feet well and massage castor oil over the soles of the feet. This will also stimulate the pressure points of your eyes located on the soles of your feet. So have you tried some of the tips and home remedies mentioned here for your dark circles or panda eyes? Did they work for you? Do you have more remedies to share? Do put down your views in the comment section. Topical Vitamin K works well for dark circles if you are consistent. A Peptide product will help increase skin thickness under the eye. I would try Kinerase or HydroPeptide. I dislike using chemicals in skincare - plus, they often smell full of off-putting perfumes, and I actually do not believe that they work. I think something like dark circles cannot be treated effectively by using external creams, not matter how much they cost. Home-remedies are a better option. Drinking two glasses of cranberry juice a day, for about a week also helps with dark-circles. I have had the dark circle problem for YEARS. I used to cry at the comments people would make, such as "wow, black eyes. That must've hurt." I tried everything, home remedies, creams, lasers, yoga, lifestyle changes, vitamins, therapy, and chemical peels. Fat grafting is the only thing that worked. Dr. Svehlak was my doctor...he's the best, honest, sincere, and ingenious. Good luck, and God bless. Slice cucumber. Chill the slices. Wash your face. Close your eyes. Place the chilled cucumber slices over and around eyes. Relax for a few minutes. Gently rub the slices on dark circles. Wash your face again. You can also apply cucumber juice or potato juice on the dark circles on face with the help of cotton for about 20 minutes. You could apply concealer around dark eye circles and then you can apply a small amount of foundation over it too. 9 out of 10 people have dark circles so I don't think that regular exercising blah blah...usually works but what you can do it get rest and don't stress your eyes out! close your eyes and rub ice on the under eye areas as well as on the eyes. this may sound very simple but its scientific. the nerves under eyes are blocked thats y they are black. take a potato piece and rub it under your eyes surly it works. You can use a light concealer. Just dont put too much on. Or you can use this eye cream by Stryvechtin. I love home remedies for beauty conundrums. you should try applying a milk and lemon mixture with a cotton ball to your eyes. leave it on for about 30 minutes and voila! dark circles and puffiness are dramatically reduced. I bought this garnier rolly-thing that is supposed to reduce puffiness and dark circles over a couple of weeks- it was about $12 at wal-mart. it has caffeine in it and that is supposed to help, and i've read good things in magazines. Also- don't rub your eyes- they get dark from broken vessels under the really thin skin there, and rubbing them breaks them. also, i've heard to put spoons in the freezer for a awhile and then put them on your eyes. haven't tried that though. Thanks! This was really helpful, I'm gonna try some of these things, and see if they work! Dab vasaline (dont rub) under your eyes before bed, you can put it on your lips too! This is a trick models use, do this nightly you'll never get the dark circles again. I had the same problem until I found out about this! equal amount of almond oil and honey and apply a few drops on black circles for 2-3 weeks. Both wrinkles and black circles are cured. Dip five almonds in water, peel them and chew nicely in the morning or make a paste and take along with 250 grams of milk daily for 21 days. Do not take oils, spices, tea and other hot products. Take 125 gm of tomato juice and squeeze half a lemon in it. Mash 5-7 leaves of spearmint in it. Add black salt according to taste. Drink this once on the morning and evening to be relieved of constipation, worm infection and acne. Take iron and calcium rich diet as their shortage are one of the dominant factors for black circles under the eyes. If you have dark circles, don't wear too much of eye makeup.It draws too much attention to the problem area. Just my two cents!!! I inherited my raccoon eyes from my mother. Ugh. Anyway, what I found works for me is an eye cream called Extreme Eye Rescue by Isabella Pelle. I searched high and low for an eye cream that helped with dark undereye circles and puffiness - and this is it for me. It's fairly inexpensive and does what it says it does. It's done a great job of reducing my undereye darkness and my puffiness is completely gone. I also feel that the skin around my eyes looks younger, probably due to the retinol in it. As an added bonus, the company offers free shipping on all orders - which is great b/c every penny counts these days! Check them out online ;). Nice blog about care of skin beauty and skin disorders. Good and educating posts about nice products. Keep it up. Cucumber is an effective and natural remedy for dark circles. Eat food with rich vitamins and iron. Include fresh fruits and vegetables in your diet. Slurp this juice to get rid of those tainted circles. Drink tomato juice with some mint leaves, lemon juice and salt. The best way to conceal dark circles on any skin tone is to use a concealer shade a touch lighter than your natural skin tone. This should be applied after any foundation or tinted moisturizer. Set with translucent powder for extra long wear. there are some rather simple ways that you can easily avoid dark under eye circles from ever plaguing you again. Adding yellow eye shadow to the concealer can effectively cover dark circles. To eliminate under-eye dark circles, choose a creamy concealer with medium pigment level and matt finish. Loose powder may end up accentuating the aging lines in the area. A silky make-up primer with a high level of silicone applied to the area before using the concealer, helps to better mask the area while it also hydrates and smooth en the lines. Apply the concealer by using the synthetic concealer brush and then press into the skin with the fingertips. This is very useful advise on how to hide the dark circles, but that’s just a temporary solution, wouldn’t it be better not to have them at all?Dark circles under the eyes are often formed due to overexposure to sun, lack of sleep or nutrients, but most common reason turns out to be undetected food allergies and accumulation of toxins in the body.So while you are using cosmetics to hide the problem, I would also suggest for you to think what kind of food is giving you the allergy (most of the time it’s dairy, wheat, chocolate, coffee ) or maybe it’s time for you to do a simple detox for the whole body and nourish it by the right foods. Makeup may cover up the problem but detox and correct nutrients can actually heal and rejuvenate your eyes and face. Blood pressure medication is the type that would dilate blood vessels in the eyes? I have noticed very dark circles appear when MS fatigue hits me as well, but I suppose that can't be counteracted except by what I usually do, which is to get extra rest. I would definitely try home remedies first. Thanks for the post. That sounds like something I need! I am a huge pessimist when it comes to dark circles. I’ve had mine (hereditary) for a while, and while some ppl tell me that I am over exaggerating, some ppl have told me that it is pretty bad and apparent. I hate when ppl ask me if I’m tired (after 8 hours of sleep) and when I don’t feel confident about my appearance or working late nights because of my circles. I once had a boss ask me if I had gotten punched in the face. Needless to say, I have tried COUNTLESS remedies: chanel beaute initiale, clinique all about eyes (both kinds), Hylexin, vita K, Roc, kinerase, estee lauder, and a whole bunch of random ones from Sephora, all “guaranteed” to work. I have used some with different types of caffeine (red tea, grean tea, coffee) and nothing. I am going to try out these remedies and see if it works. You simply soak tea bags in hot water,rinse in cool water,to create an eye pack that really does wonders!Then apply for 20 minutes or so,and this will immediately reduce puffiness and dark circles will begin to fade rather quickly!Chamomile night creams,and eye gels will do wonders as well and are quite reasonably priced. If you don't want to use the tea bag method, there are creams you can buy that are made to reduce the appearance of under eye circles. The Made from Earth Vitamin Enhanced Moisturizer is AWESOME as an under eye cream! i have dark under eye circles (damn family genes! haha) but the Made from Earth Moisturizer is perfect for me. you can definitely tell a HUGE difference when you apply it. then just put a tiny bit of under eye concealer over it, and you're good to go! i'll definitely buy it again! there's this product that you can buy at any cosmetic store which is a liquid liner solution where you put it under your eyes....it relaxes your skin and after 2 weeks of using it, the bags go away. If its around the eyes, go get some preparation-H. It increases circulation which will get rid of the dark circles. Also, having too much or too little sleep can make the darkenss much worse. I hardly ever sleep so I use preperation-h and then I dab a bit of dream matte mouse makeup under my eyes. Chose a shade lighter than your complexion to even it out and you should be circle free! Take some 8 teaspoons of gram flour(Bengal gram), 4 or 5 drops of lemon juice and 1 teaspoon of turmeric power. Add water to it and make it into a paste. Apply it on your face. Allow it to dry for around half an hour. Finally was your face with water. Do this procedure for around 4 weeks surely you will note the difference. I have it hereditary. This was really helpful, I'm gonna try some of these things, and see if they work! if you want a more long-lasting solution, the best thing to do is to consult a surgeon. He or she can tell you about the various surgical and nonsurgical options that are available, such as injections or skin tightening. Apply a cotton ball moistened with a cool black tea brew under your eyes for 10-20 minutes and relax. Less known tip is to use camomile or linden brews instead of the black tea. Feel free to try them as well, but only if you are not allergic to those herbs. Tea water too reduces the puffiness and dark circles of the eyes and rejuvenates the eyes by refreshing them. You can boil tea in water and restrain the leaves. You can refrigerate this water in the freeze to make ice cubes. Keep these ice cubes on the eyes in a cotton cloth for 20 minutes. Always go out in sun wearing sunglasses and after applying sunscreen lotion on the skin around the eyes. Juice of raw papaya is the best treatment for blemishes. Apply fresh juice of raw papaya on pimples and get a fine result. Dark circles...aargh! I inherited them from my Dad. There's really nothing I can do about it, except to keep them as minimal as possible one should, like you said, get enough sleep, drink plenty of water etc. It is also believed by natural medicine practitioners that dark circles can be a sign of a toxic liver - so a detox every so often doesn't hurt either. Like I said, I've inherited them so, even when I live a healthy lifestyle I still have them. I use an eye contour gel and cream and massage under my eyes with both very well every day to get the circulation going. I also use a mineral makeup concealer, which has been a "can't do without" product for me since my teen years. I used to have puffy dry skin under my eyes...very sensitive. I've used other under eye creams and end up irritating my eyes, since most contain alchohol and other chemicals. What solved my problems was the Made from Earth Olive Night Creme. I tried over night and the next morning felt refreshed. My under eye area was soft, moisturized and HYDRATED. I use it once or twice a week. I've been using it for quite a while now and I've seen a dramatic difference. I found that by applying it and then laying down - I kid you not, you'll see better and immediate results if you do it that way and look great! MAC makes good concealers and Quo (a canadian make-up brand) too. Lise watier is my favouritee concealer though ! You can either apply your concealer with you fingers or a concealer brush. I own a concealer brush but I always apply with my fingers because it heats the make-up up and makes it more manageable. Do not scratch the under eye skin. Diet, which is rich in nutrients helps to remove dark circles around eyes. Lightly tap the under eye skin with one or two fingers to. Increase the blood circulation. Sun exposure, lack of sleep, lack of nutrition, pregnancy, menstruction, allergies, heredity, age etc are theCauses of dark circles under eyes . Causes of dark circles under eyes are Sun exposure, lack of sleep, lack of nutrition, pregnancy, menstruation, allergies, heredity, age etc. check your diet and exercise. A deficiency in some vitamins and minerals can contribute to this. Sometimes anemia or lack of vitamin E are the cause. Make sure you are eating fruits and vegetables that are filled with vitamins. Getting enough exercise will also make a difference. It relieves stress which will show in your skin and on your face. The caffeine and antioxidants found in tea bags will also help. Just place the tea bags around your eyes and the caffeine will help reduce the water which leads to the puffiness and bags. Along with some lifestyle changes and some home remedies, you can also use a product designed to help. Make sure you choose a natural product, that is good for your skin. Anything in excess, is bad. Try cucumber paste for your eyes. dark circles are usually a sign that ur not eating healthy.Try drinking more water and eating more fruits and veggies. And make sure ur sleeping 7-9hrs a day. Do not use bleach or peels to make the dark circles around eyes light. Do not scratch the under eye skin. Drink atleast ten to twelve glasses of water everyday. Have a blood test done for your haemoglobin level and check with your doctor for extra vitamins and proper diet routine. Just want to say thank you very much for your tips and advice. Awweh too little sleep I'm guessing. Get more shut eye, and place cucumbers over your eyes every so often. That should make it less noticeable. I have dark circles too and I've tried everything. the best I've gotten is to use a moisturizer everyday underneath and around your eyes. you can try a cream from a brand like neutrogena or clinique that makes them go away, but they honestly don't work well. I've also heard of putting tea bags or a cold cloth over your eyes. Try to avoid sleeping too long since that can also cause dark circles. Other than that, try to stay hydrated by drinking lots of water and keep a balanced diet with lots of fruits and vegetables.In the mean time if you want cover them up a bit to make them less noticeable, buy yourself a concealer that's a peach shade. The peach tone of the concealer will help cancel out the dark/green undertones of your dark circles. i have used biore cooling eye gel! it's basically so easy, you squirt a little bit on your hand and rub it under your eyes. it's very effective and within half an hour, your puffed eyes and dark circles will diminish. but i think it has discontinued but if they happen to be your drugstore or the clearance section of your supermarket or something, i recommend it! vigorous face massaging with natural unadulterated oils had permanently got rid of my acne and also removed my bags/circles. The massages greatly tighten skin under and around the eye area and the bags go away. (1) Do long up and down sweeps close to nose from chin area up to near eyes. (2) Do another up and back at an angle from chin point to cheek bone. (3) Do fast up and down massage close to eye from cheek bones at an angle of 45 degrees (on your crows feet). Do for several minutes daily - will markedly tighten skin in eye area and diminish the circles in the first two or three days. facial yoga exercises help a great deal. They also tighten and firm skin and help get rid of circles. Find on Youtube. Do the "The lion face" and try to hold for 30 seconds. repeat throughout the day. Great post! I love anything natural and simple. I”m looking forward to hearing more from you and reading your blogs – keep them coming! Chill teabags and put them over you're eyes for 10 minutes. Deficiency of blood, loss of complete sleep, abnormal metabolism are main. Almond oil is one of the best home remedies for dark circles under the eyes. Do a regular under eye massage using almond oil for 15 minutes. This is very beneficial and safe natural treatment for removing dark circles. Mix 2 tablespoons of tomato juice and 2 tablespoons of lemon juice, and apply this mixture on under eye area. This is an effective remedy for dark circle under eyes. There are undereye lightener creams for people with dark circles. you could probably find it at any store that sells makeup. To cover up the dark spots in the mean while, dash on a powder that is a few shades lighter than your skin color. The dark circles can be removed. You will put 2 teaspoons in the freezer for about 30 minutes. When they are frozen lay down & apply them to your eyelids. You should relax or meditate while doing this. Stress does not help skin either. You may have to do this several times but it will work. One more simple remedy to try. Before you retire to bed, take a wash cloth and dampen it with cold water. Squeeze out the excess water and then cover your face with the cloth making sure to cover the eye area. If you can, leave it on over night or at least for a few minutes. The Body shop Vitamin E eye cream it eliminates dark circles, puffiness this one really works. What helps me is indulge soothing eye gel from Mary Kay. It's 15 dollars for a container but I think it really helps! rubbing a vitamin E lotion on your eyes every night before bed will help to firm your eye area. to get rid of them permanently would probably mean surgery but MAC makes a good cream called fast response that reduces them. Bags can be there for a few reason: lack of sleep, lack of moisture, or just your genes. Try placing some chamomile tea bags under your eyes, brew some tea, and then freeze the bags. Place them on circles for 10-20 and sit back and relax. Also try some using some eye cream, a moisturizing one works best. And just apply it all over your eye area, on circles and lids. Use your ring finger and just dab it around and don't tug too much. Good diet is reflected by your skin. Take well balanced diet rich in rich in iron and Vitamin A, like carrots, . Exercise increases blood supply to the skin and so does to the eyes and skin around the eyes. Consequently you will see a difference in the intensity of dark circles under your eyes. Cold water is very good for your eyes, wash them daily in the morning with cold water. Protect your eyes from direct sunlight and smoke. Use sun glasses whenever sun exposure is expected. By the time your dark circles are under treatment, use a good dark circle concealer to hide them. Try to sleep early and not get too stressed. The circles are caused because you didn't have a proper sleep. The dark circles around your eyes will clear up soon if you sleep properly and get enough rest and stay out of stress. In the mean time, you can try covering it up with make up. you get some cold milk, make sure it's 2% or whole because it has some protein or extra substance that does something with the skin. So take the milk and put some of it on a tiny folded towel, soak it or however you want and then put the soaked towels on the 'dark circles' area. Then repeat as much as wanted. researchers are actually believe that sleep has nothing to do with bags. heredity and genes seem to be the problem. i got the same problem and i think it may have something to do with maybe a vitamin deficiency or allergies. lots of products claim to reduce them, most of which dont work. i'm trying the new avon product, its only been a few days so we'll see. i've found that skin lightening products really work well, but the problem is with the safety of ingredients. google triluma, i've heard it works wonders on dark circles, its a product doctors prescribe so it seems to be safe if used for a short period of time but is expensive about 100 bucks. in the mean time you can find vitamin c serums to just overall brighten your skin, that will help a bit. and make sure to wear sunscreen!!!! It is believed that almond oil can gently exfoliate your skin and can activate the cells around your eyes. This can help in tightening and lightening of skin color around the eyes. You can mix in equal proportion almond oil and honey and apply the mixture on the dark circles around your eyes. It is suggested that vitamin K can treat damaged arteries and capillaries around our eyes. This can promote blood circulation and can treat dark circles around your eyes. One can take vitamin-K rich food such as kiwi fruit, cabbage, sprouts, spinach, etc regularly to treat under-eye dark circles. Mix two tablespoons powdered milk and a little bit of water with a tablespoon of honey. Apply the paste under your eyes and let it dry for ten minutes. Rinse off with water. it could just be genetic. I agree that another cause of undereye circles is eyelid swelling during sleep,I experience this many times. Anyway,thank you so much for the information. Get even more sleep. Rest your eyes, avoid strain from too much television, cellphone or computer use. Use some kind of eye gel pack and freeze it. Usually, the black is caused by overworked eye arteries! Dark circles are a sign of yeast. Check what you/he/she is eating frequently. For example: lots of grain, wheat, etc. Dark circles are sign of allergy obviously, but finding the allergy isn't as hard as you think. Fruits are high in Phenols, so when you eat for example tomatoes, ears may turn red due the high phenol it contains. Sometimes bags under the eyes are stress related.. They can also be caused by health conditions or allergies.. There are lots of home remedies that you could try such as putting hot tea bags under your eyes for 10 minutes.. They also have creams that are suppost to make them lighter and less noticeable..
bags and dark circles can be caused by many things. One is heredity. If your folks or other family members have this tendency, it might be that. Another thing is allergies and sinus issues. You can take a dail antihistimine and a decongestant and it will improve the circulation in that area and help with your eye puffiness if this is a problem that you do indeed have. Another thing is oral hygiene. Floss and brush your teeth every day....twice a day is best...having bad gums can cause circulation issues as well....so...it can be a lot of things, some you can control, some you can not...lack of sleep only magifies the problem...so your having enough sleep is a good thing! You might want to run this by your doctor and your dentist as well! See what they have to say! Wear concealer if they bother you that much, lol. Everyone has some type of rings under their eyes, but I'm a girl and I wear make up so.. it doesn't bother me. Unless you had black circles like a raccoon, I wouldn't worry about it being cancer or something. Usually caused by lack of sleep or stress, just try to get more sleep and they will go away. Some more details are at my source if you wish to review them. sleep more. seriously, that's the way to go! Dark circles under your eyes can make you look older than you are? Under eye circle can be due to lack of sleep, nasal congestion, allergies, poor hydration, and generalized ill health. I have tried many different eye creams and some of them very expensive. They either burned my eyes, made my skin very greasy, or just didn't work. I did not find a product that worked for me until I tried Eyevive. I tried Eyevive not expecting very much and I was pleasantly surprised. I saw the dark circles around my eyes disappear. Black Circles As in Bags Like there under your eyes like if you hardly sleep? Well if that's what you are talking about then you can get a spoon & stick it in your freezer for an hour then place on the black parts of your eyes. Grate a potato and put an equal amount onto two cotton handkerchiefs, gather them up and fix into two parcels with elastic or hair bands. Put them on your eyes for 10mins and you can actually feel your circulation speed up, it REALLY WORKS! Regular skin care is required to maintain the area surrounding your eyes. Use a gel or a cream and rub it gently around the orbital bone. The orbital bone is the area that falls directly under the eye structure. Be careful not to rub harshly when you rub around the eye area. The harsh rubbing can only lead to more irritation. Apply the cream to the skin and relax for sometime. If you have to put on a facemask, then soak the little cotton pads into the soap water and place it on the eyes when they are closed. Otherwise, you may use them around 2 cucumber slices to make your eyes cooler. In this way you can provide a pleasant feeling to your eyes. And you can get rid of your dark circles around your eyes quickly. Your skin will glow when these circles vanish. reduce your stress level, reduce your salt intake, keep your body hydrated by drinking plenty of water and reducing your alcohol intake if applicable. Apply cool leftover tea bags (chamomile tea) on/under your eyes for approximately 10 minutes as well as drinking the tea which helps alleviate inflammation on the body. Plus some say applying the following paste around the eyes is helpful, paste ingredients: 1 tsp. tomato juice, 1/2 tsp. lemon juice, a pinch of turmeric powder, and 1 tsp. of flour. Concealer essentially covers any dark spots on your face and evens out your skin tone. It 'conceals' irregularities. It is most often used under the eyes, to conceal dark circles. It is first applied on the dark areas, and then foundation is applied all over the face to even it out. hemeroid creme. beauty contestents use it all the time, it gets rid of the bags and dark circles under your eyes. Bags and circles under the eyes can be effectively eliminated with facial exercise. Revitalizing Eye Treatment removes the dark circles, wrinkles and swelling etc of eyes and makes the eyes beautiful. The most effective remedy for dark circles is also the most cliche. Thin slices of cucumber applied to your eyes not only helps to lighten the skin, but also soothes and cools the eyes. This can be especially comforting if you've been up late the night before or your eyes are red and tired from allergies or staring at a laptop screen. how to look good and to remove darkcircles? Apply the leftover eggwhites in the bottom of the shell to the lines under your eyes. Skin whitening creams clear the dark circles around the eyes very effectively and quickly. These creams protect the skin from ultraviolet radiation and reduce the formation of melanin pigmentation. Swallow a capsule of cod liver oil everyday. It strengthens eyes. Take a teaspoon of tomato juice, a few drops of lemon juice, a pinch of turmeric powder and a little flour, enough to make a paste. Apply this paste to the under-eye area, and wash off after fifteen minutes. you can wash your face with soap after applying the tomatoes and cucumber. Also, try and get enough sleep and eat a wholesome diet. dark circles could be caused from insufficient amount of vitamins in your diet. For your skin to look vibrant you need to supply your body with nutritious food , especially fruits and vegetables. Whole grains and essential fats are also very crucial. Ditch the burger and fries for something wholesome and nutritious. Don't think about pleasing your appetite and think about nourishing your body. You might not like the changes at first but you will adapt and begin to enjoy it. Reducing bags under eyes is very easy but make sure it is not associated with any disease process. Never strain your eyes or make your eyes very tired, give them the rest they need. To get rid of bags and puffiness under your eyes, brew two large Lipton tea bags until the tea is strong. The eyelift is an outpatient procedure that takes about an hour. It requires only local anesthesia and light sedation and takes about two weeks to heal. though, that many people can go out with a little make up after 8 days. Although the cost of an eye lift can be high -- $6,000 or more in some areas of the country -- results are definitely lasting. I had mine done almost 25 years ago,and it's holding well. So I'm living proof the effects last at least this long. There are many causes of dark circles, from age, heredity, allergies, cold or sinus infection, bone structure and glasses which are not so commonly known. Buy a box of regular, old fashioned unflavored gelatin (e.g. Knox) from grocery store. Take a small cup or bowl and put in 1 teaspoon of the gelatin mix. Add one tablespoon of boiling water & stir for a minute. Test it on your wrist to make sure it is not too hot. Then, using a cotton ball, pat it under your eyes as you would an eye cream or gel. Go lie down and listen to some music, or take a bath & let it stay on for at least 30 minutes. Then just rinse it off.Gelatin is very high in Vitamin K & Biotin. It will not remove your dark circles on the first application (but you will notice a difference), but if you do it daily for a week, and then 2-3 times a week for maintenance, you should notice a drastic reduction in dark circles. For eye puffiness, any tea bag (herbal is better, especially eye bright), slightly cooled, placed on the eyes while you rest. To lighten darkcircles under your eyes, wrap a grated raw potato in cheesecloth and apply to eyelids for 15-20 minutes. Rinse with warm water.. The best overall eye tonic for under eyes darkcircles cure is eye bright (a herb). Make a tea of it and either use the tea bags or soak cotton balls or soft gauze in the tea and apply to eyes as a compress while lying down. To remove dark circles present around the eye use 50 gm of tulsi +50 gm of pudina and 50 gms of neem leaves . make a paste mix it with rose water and apply on the dark circles around the eyes and see the difference. What is it in Vaseline that gets rid of dark under eye circles so well? Lol. Nothing! Vaseline has petroleum in it, from the Petrol gasoline family. It's molecular structure is too big to cross the skin barrier so it WILL CLOG PORES (causing acne, unhealthy skin) why it helped your dark circles? It must have been a fluke, because of all the nasty chemicals and yes, toxins, you surely aren't doing yourself any favors by using it. I know a lady who used it nightly and she developed some nasty undereye bags. There is nothing theraputic or curative in vaseline, whatsoever. It is a barrier cream and dosen't let your skin breathe. It is the equivalent of rubbing gasoline on your undereye area- something to think about. you need a lot more sleep than 7 hours to keep yourself rested and your skin nice. trust me, i know it's hard, but you need to sleep more. 10 hours is ideal. also, try clinique. they have this flesh-colored cream that really helps. also look for a gentle eye moisturizer to help with dryness. By using liquid concealer and gently patting it over dark under-eye circles, then blend with your ring finger you can hide dark circles. I don’t like to put any sort of chemical into my body or onto my skin, that’s why I prefer natural remedies. I worry about the chemicals they put into over the counter cosmetics. I had dark circles since I was 15 and tried all kinds of creams and concealers. They work great for covering but I never found a product in 20 years thats magic enough to make the dark rings fade. When I started to try alternative medicine and visited homoeopaths, TCM (Traditional Chinese Medicin), and some others … all told me that the dark circles come from the kidney. And if I am not suffering from a kidney disease (which I never did) than is the reason that I don’t drink enough or the wrong things.AND IT WORKS!I can see it on days when I drink too much coffee and less water. Try it about one week and you will definitly see the results in your mirror.Sleeping min. 6 hours and drinking 3 litres of water or tea makes the dark circles fade away in few days. For dark circles around the eyes, drink two glasses of cranberry juice a day, for about a week ( make sure it’s a nice concentrated quality). you’ll be amazed at the results. Rose water is considered to be a natural coolant for the body and has been an old home remedy for generations. Apply two to three drops of rose water on a cotton ball and gently massage on the affected area of the eye for five to six minutes. You will see the result in two to three weeks. This method is considered to be one of the most effective cures for dark circles.The dark circles treatment should be started as soon as possible to avoid it from increasing. You could try using Petroleum Jelly or Vaseline. These ointments retain moisture and stimulate the skin into getting thicker. However, it might take a long time for the thicker skin to be visible. get moisturized and re-generate itself. This is not possible to hide Dark circle without make-up. Anyway, you don't have to hide dark circles on your face. Try the Loreal facial wash and cream products. Hopefully, that problem will be solved soon. I've heard that you can create a paste from a teaspoon of tomato juice, 1/2 teaspoon lemonjuice, a pinch of turmeric powder and a pinch of gram flour. Applyunder eyes for 10 minutes. It helps get rid of dark circles under the eyes. I've tried cucumber and it can really soothe your eyes. Drink lots of water too to make your skin hydrated. Find out how two organs are responsible for 60 percent of all cases of dark circles. Treat them and kiss your dark circles good bye forever using natural inexpensive home remedies. Make your sleeping problems and Dark circles vanish at the same time with simple remedies that will allow you to sleep deeper and wake up well rested and fresher making your daily routine enjoyable and effortless. Menstruation and dark circles are also related, reduce the symptoms of premenstrual aches with some very powerful home remedies and watch those dark circles fade. Causes of Dark Circles Under Eyes--Poor Blood Circulation, Leaking Capillaries,Nutrient Deficiency, Loss of Hyaluronic Acid,Thinning Skin and Finally your genetics may be the thing messing it up for you if it is common in your family to have very thin skin under the eyes, the skin may appear darker. Almond oil, rich in vitamin E and has anti-aging benefits. Cold tea bags, like chamomile tea. The tannins in the tea remove discoloration. Cucumber slices, it is very refreshing and hydrating, and cucumber does have a lightening effect. Slices of avocado, which also is rich in vitamin E.All of these things can just be put under your eyes, and be removed after at least 15 minutes. I haven’t tried all of them myself so I can’t say if they will work, but it is always worth a try; at the very least you will get some relaxation. Reduce salt intake. Excess salt causes the body to retain water in unusual places, and this can result in puffiness under the eyes. Too much salt can also impair your circulation, and cause the blood vessels under the skin to appear bluer. Mix one table spoon of caster oil with the same amount of sesame oil. Apply it over your face before going to bed. This is an awesome treatment for eliminating eye wrinkles. Great tips. I love the “earring” tip. I use a cooled green tea bag, too. It really tightens my face. buy some black tea and soak the tea bags in cold water and press them on your eyes where the problem is. Exercise! This may not be the answer that you were looking for, but believe it or not, regular physical activity is exactly what you need to sleep soundly through the night. When your body is active all day long, it will be much easier for you to fall asleep easily and rest at night. put wet teabags on your eyes for about 30 minutes a day, it will help eliminate wrinkles. I try to use as much natural products as possible. eat healthy and drink water and sleep often. A dark circle under the eyes is the common problem faced by everyone all over the world. There are several reasons behind getting these dark circles but you can hide them with proper makeup. The yellowish shade of concealer should be applied on the dark circles with the help of fingertip. After blending the concealer well apply the translucent powder on your face and then do you usual makeup by applying foundation on your face. my eyes are constantly swollen and the dark circles are obvious to all. A few years ago I had stopped working at night shift and my eyes were almost back to normal, a little puffy but much better in appearance, now its back again. Potatoes contain an enzyme called catecholase (or catechol oxidase), which is used in cosmetics as a human skin lightener.Potatoes are very good remedy for dark circle. Now I am using Almay Clear Complexion concealer to hide my dark circles. I also like liquid type of concealer because it is not so heavy. get seven to nine hours of sleep every night. What you eat counts! Eat a healthy, balanced diet, drink plenty of water, and make sure you are getting all your vitamins and minerals. Be sure to get plenty of fruits and vegetables, especially cabbage, spinach, and other leafy greens. Eat at least 2 cups of organic fresh spinach everyday. Additionally, eat a handful of raw almonds (unsalted and unroasted) between meals. Avoid salty foods, as salt causes the body to retain water, which equals bloating and puffiness that is particularly noticeable under the eye. Treat your skin while you sleep. Just before bed, lightly wet a washcloth with cold water and place over your eyes as you sleep. By morning, you should see an improvement. Avoid smoking, as it causes vascular problems that not only threaten your health, but also make your blood vessels appear more prominent under the skin. there is eye bags under my eyes. any remedy to remove it naturely. Make sure you are not over straining your eyes or keeping too many late nights. Slice cold cucumber into round pieces and put it over the eyes. Also Potato slices kept over the eye area helps to lighten and calm the skin around the eyes. Take the slices after you have kept them over the eyes and in small gentle circles go over the effected area with them. If you can find our latest product White Pearl Under eye Dual treatment it would help you a great deal as well. Make two muslin pouches. Fill these with this mixture, first whipped together in a cup. One tablespoon of fresh double Cream ( Malai ) grated cucumber and potato and a few ground almonds. Refrigate the mixture, fill the muslin bags with it when nice and cold. Now lie down with these bags filled with some of the best from nature. Once you are through you can take out the mixture and rub it in as well before washing it off. How can we prevent and reduce the fine wrinkles around the eyes.